This webinar provides nonprofit leaders and those that fund them with a clarifying and more comprehensive way to understand, portray and sensibly support budgets. 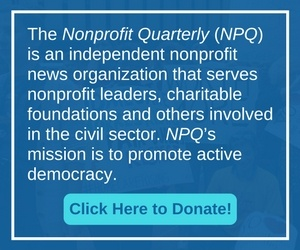 For Funders, this webinar can be paired with NPQ’s recent articles on multi-year, unrestricted grantmaking. As Merriam-Webster’s representatives have pointed out, there are many stories in the news that may have conspired to drive folk to look up the word “justice” more than any other last year. Maybe we can consider it a social opportunity? Linguist George Lakoff and former press secretary Gil Duran deconstruct Trump’s anti-democracy narratives and offer the media—and civil society, we believe—suggestions on hacking them. A Conservative student seeks understanding in spite of her white-dominant views. Is there something more sinister at play? The concept of “white space” has crossed over from black space into the public conversation about race in the US. But many are using a white space approach to white space, including nonprofit leaders. In Richmond, a Civil War museum’s Black director seeks to curate narratives that honor a multiplicity of perspectives.